Since chldhood, I am much inspired by my father. I lost him long time back.He had strong faith in Shiva and His different manifestations.Early morning he used to meditate for two hours. I remmember he used to chant a bhajan in which there was reference to Khwaza Khizr. The death of my father brought a big transformation in me, i used to dream of my father guiding me the path I had to follow. I have always worked on my intutions dreams, visions since childhood.I found myself very close to supernatural powers. They guided me, protected me, forewarned me.The superconsciousness united me with paranormal forces.Many times I dreamt of a saintly figure in green weil standing on a fish.Deep inside I felt he is the Khwaza Khizr about whom I heard from my father. While I browsed the internet, I found the same figure as Khwaza Khizr. The Green Man , you are welcome in my life, I am passionate about you and express my gratitude for you to shower grace on me. Hello everybody! How's life ? Just sit down in a comfortable posture and do nothing.Withdraw from all thinking, relax, take deep breaths and focus the mind on one object.Just be aware of what is happening within you. You are not thinking, yet thoughts are there, you are not imagining still there are images.Meanignless objects,wavering mind,unnecessary worries,different people, their talks, all this stuff need to be suspended and withdrawn. Do not identify with them, Let all the images fall off. Let people disappear from your mind. Keep aside worries.Now you experience the silence.Be in this moment for some time focus with open eyes on light or image of deity. When eyes get stressed, close them and see the reflection inside between the two eyebrows. Concentrate and be stable.Again take deep breathings,watch the inhaling,exhaling for few minutes.Now come out refreshed.Now you are stable in calm mind. Why do we require meditation ? Because peace can not be attained through different concepts and thoughts, not hrough different passions and desires, and never through reasoning.Calmness only reflects through meditation on the onlooker. feeling at all. Unconscious work is called instinct. breathes, he moves the body wilhout the feeling of ego. to fulfil reason and is in harmony with it. yourself. Experience is thc greatest teacher in man's life. and realization comes to the man who meditates regularly. state by faithful practice, reaches the Kingdom of God. body. The conditioned soul wants to enjoy the senses. he forgets his eternal relationship with the Supreme Lord. 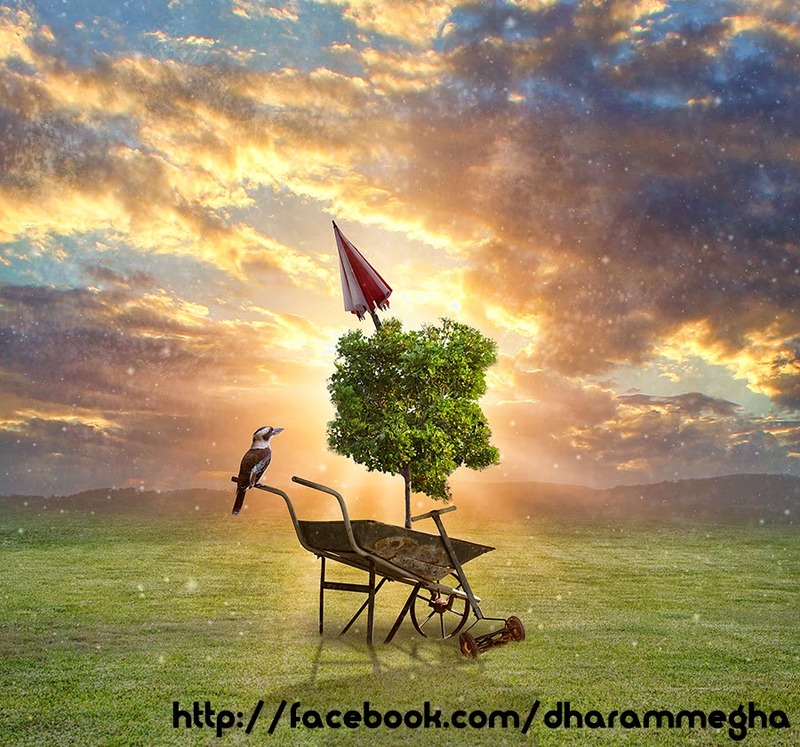 Only knowledge is not sufficient for man's liberation. service to the Supreme Lord even without seeking them. the Lord, never falls down from his constitutional position. To reach the perfection of human life you do not need to wait for many more births to get enlightened. In this birth only, you can attain perfection in a short time by the practice of 'Mahayoga - The Raj Yoga' Mahayoga is one of the grandest science in the whole Universe. The goal of Mahayoga teachings is, how to concentrate the mind and discover the innermost recesses of your mind, then how to generalize their contents and form your own conclusions from them. In Mahayoga, you learn to discover and manipulate the internal forces and get control over them. Besides, you learn the innermost secrets of your body and mind-how the sensations travel from the external world to the internal mind, how the mind- receives them and send them to the determinative faculty, from there how they reach the soul and how the Supreme Soul witnesses and sanctions them with in. You learn in meditation these fine stake of perception and directly experience the different mental states of sleep, dream, waking and trance. Through self realization, you recognize your pure consciousness and come in direct relation with the Supreme soul. Your pure consciousness is the Eternal Abode of the Supreme which is also called the Kingdom of God. When you are successful in reaching there, all your pains wiil cease, material lust will vanquish and you will reside in permanent Bliss. 1. Yama - Not killing, truthfulness, not stealing, continence, non- receiving of gifts. 2. Niyama -Cleanliness, contentmen, austerity, study, self surrender to God. 3. Asana - The easy and erect posture. The lowest one 'Muladhara' is at the lower end of spinal cord and the highest is Sahasrara on the top of head. All energy has to be taken up from its seat in the the Muladhara and brought to Sahasrara where the Ojas or Tej is stored up in the brain.Yogi controls his energies and converts them into inner force and through that inner force, reaches the highest infinite energy in him. 5. Pratyahara- Restraint of the senses from their objects and checking the outgoing powers of the mind. 6. Dharna- Fixing the mind on one object. or on one part. In Dharna you have to hold the mind to certain points mentioned in pranayama.You have to force the mind to feel certain parts of the body and exclude others. Meditation is the method by which you attain the true knowledge by the understanding of your innermost secrets. The mind is an instrument in the hands of the soul, through which the soul catches the external objects. The mind constantly changes and vacillates. When the mind is attached to one object and it wavers no more, the power of the mind is concentrated and turned back upon itself. You become self conscious in meditation and elevate yourself from material plane. No longer, you remain a split personality now. You become a proper humane. In trance, you reach beyond body, mind and soul and get enlightened. The potential God becomes manifest in you. You are no more in the bars of man or woman, you are only a divine self. You reach the kingdom of God. You become universal, one with the existence. Early mornings and early evenings are best suitable for Mahayoga practice because nature remain calm in those periods. Techniques of Mahayoga have been much simplified in the book for your interest and convenience.Keeping sexual restraint, obstention from drugs and alcohol and purity of body and mind would promise you definite success in achieving the 'Super Consciousness' state. No faith or belief is necessary in Mahayoga. The facts of your awakened state in meditation require no dreams and imaginings to prove them true. Truth requires no prop to make it stand. Throw away all doubts and fears and have strong faith m your own self. Learn Mahayoga in the company of 'Sadguru" and illumine yourself. Today is shivratri, the auspicious day to rediscover your own potential. The journey of Kawariya is symbolic of oneself moving to the Ganges of knowledge and bliss. Human mind lives on the plane of sense conciousness.By following spiritual discipline and yoga,the mind enters into the realm of spritualized conciousness.Now there is no I am.I is merged into am.That am is Om - THE EVERLASTING EXISTENCE, the Ultimate Truth, just swim with this current. It is untrue, Not fair.